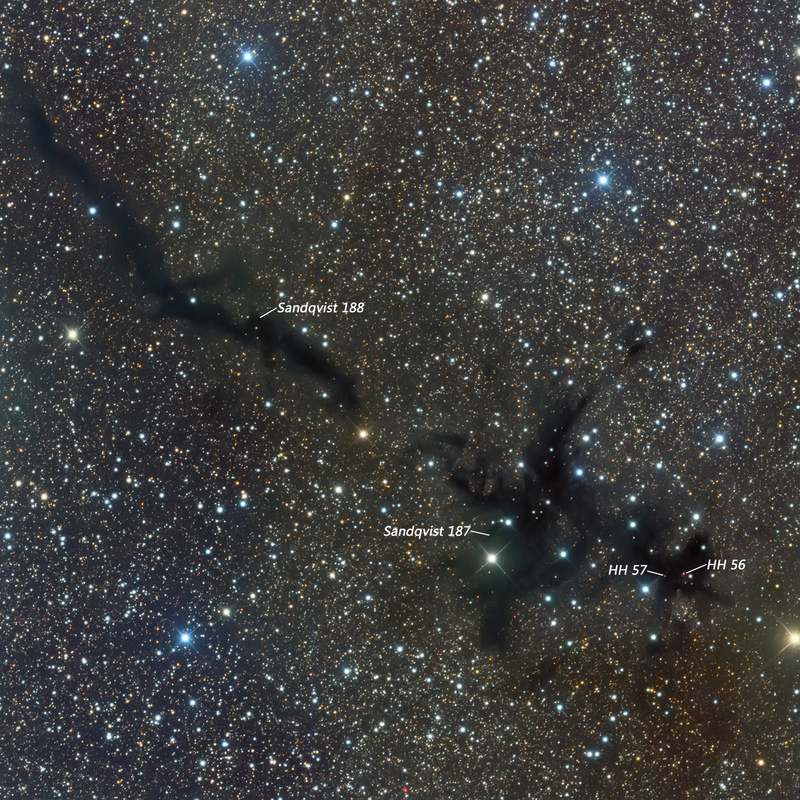 Sandqvist 187/188 is a set of dark, elongated clouds in the constellation of Norma, referred to as the Norma Cloud by Sandqvist in 1977. 187 is in the lower right, and the more linear 188 is in the upper left. This is a star forming region. Low mass stars are mostly formed in these dark clouds. Its distance estimates vary widely from about 500 to 2,300 light years. Sandqvist 187 contains several HH (Herbig-Haro) objects, shown below in the annotated image (thanks to S. Rasool). HH objects are patches of nebulosity associated with young stars that create jets that interact with the surrounding gas and dust. North is up toward the right and east is up toward the left. The image is about 34.5′ x 34.5′. This is a really nice image of an unphotographed dark nebula! You can even see some Herbig Haro objects.